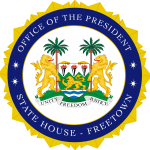 State House, Freetown, Thursday 6 December 2018 – The New Ombudsman, Lawyer Leon Jenkins-Johnston, has subscribed to the oath of office before His ExcellencyPresident Julius Maada Bio at State House in Freetown, in accordance with the Constitution of Sierra Leone. He said he was honoured and privileged to be appointed to such a very high and distinguished office in the country, adding that his appointment was a clear demonstration of the President’s determination and desire to move the nation forward in the path of democracy, good governance and accountability. Lawyer Jenkins-Johnston also promised that during his tenure as Ombudsman, there would not be business as usual as he was determined to ensure that complaints brought to his office would be investigated thoroughly and without fear or favour. He disclosed that over the next five weeks, he would be doing a fact-finding exercise on the strength and capacity of the office and would be looking at the strategic plan for 2018-2022. “When I received the appointment, I staggered a bit but drew inspiration from and found comfort in the determination that I have seen so far in his Excellency the President and his desire to make this country better at all cost. Thus, his frequent phrase ‘Paopa Salone for betteh’,” he said. The Office of the Ombudsman was set up by Section 146 of the 1991 Constitution to investigate complaints from members of the public, who claim to have suffered injustice as a result of maladministration by government ministries, departments, agencies, statutory corporations or institutions established with public funds, in Sierra Leone.